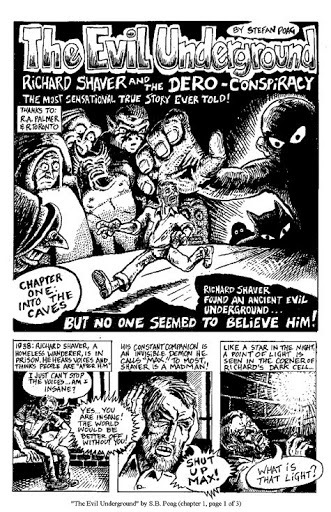 I’ve been interested in Richard S. Shaver, an artist, author and fascinating part of American popular culture for a while now (link to my blog entries on Shaver). 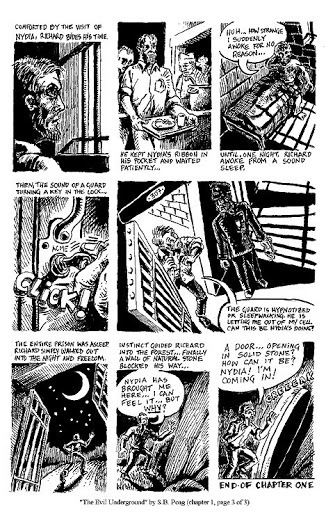 Some time ago, I decided to attempt to draw a comic book about Richard Shaver’s life, his work, his art and his unusual ideas. I’ve presented the first three pages of this effort below; I’ve decided to try to tell the story out of chronological order, trying to touch on what I see as some of the important moments. Until his death in 1975, Richard Shaver insisted that everything he described (which many would dismiss as paranoid delusion) were the absolute truth. 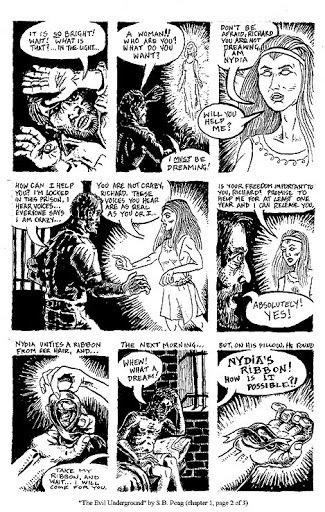 The first chapter in the comic deals with the story of how a mysterious woman named ‘Nydia’ befriended Richard while he was in prison and, through mysterious methods, engineered his release. Subsequent chapters will deal with other events from Shaver’s life. As author and artist, I don’t consider it my duty to tease fact from fiction or to try to debunk Shaver’s stories. There is no search for an objective truth here. I’m going to try to tell the majority of stories of Shaver’s life as he told them with occasional references to dates and places as needed. I am exploring my own fascination with the interesting body of work that Shaver left behind and the very compelling story of his own life (and the life of the planet and her people) that he told. There is, of course, going to be a lot more that the three pages below (click on the images to see an enlargement). When I get further I will be interested in attempting to place the book with a publisher (although finding a publisher interested in publishing black and white comic book bios of outsider artists might be tricky). That's like a time machine back to the underground scnee of the late 60's and 70's. In a good way. I dig it. Yeah, I'm hoping you're able to publish it, too. I've always been interested in Shaver ever since my grandmother told me about the Dero and Tero when I was a kid. Thanks for the suggestions and words of encouragement, guys. When I was a youngster, a friend of mine and I used to try to draw our own 'Superhero' comics and I was always frustrated that I couldn't draw like Buscema. I'm still working on my 'method' of doing this — I had a written outline, but what I drew didn't end up fitting the written outline very well and there were some scenes in the written outline that just made for uninteresting comics (how many pictures of R. Shaver sitting and thinking does the story really need? )… so it is a work in progress; changes will come. Wow, this is really cool. I mean, impressive and exciting-wise cool.